Dees, Smith, Powell, Jarrett, Dees & Jones, on North William Street in Goldsboro, was founded in 1914 by William Archie Dees. His son, William A. Dees, Jr., joined the firm in 1948, followed by Bill Smith in 1955. The law firm of is one of the oldest, most established, and most resourceful law firms in Eastern North Carolina today. Our reputation for legal professionalism and client service makes us a familiar name across the state of North Carolina. Our attorneys are knowledgeable in their fields of practice and serve in a variety of state and local professional associations. All of our cases are treated with the highest degree of dedication, care, and personal attention. Whether helping a client secure a lease on commercial real estate or defending him or her from a traffic violation, we serve clients of every type and situation, including the Spanish-speaking community, at every level of state and federal courts, and we handle legal issues ranging from workers' compensation and motor vehicle accidents to traffic violations and real estate transactions. To schedule a free initial consultation, contact the firm through this Web site or call us at (919) 735-8311. 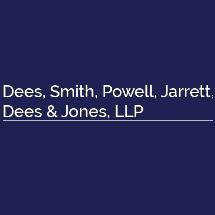 At Dees, Smith, Powell, Jarrett, Dees & Jones, you will be treated courteously and receive quality legal services in any of a wide range of legal areas: personal injury, Workers' Compensation claims, estate planning and administration, traffic violation defense, business litigation, timber transactions, professional negligence claims, residential or commercial real estate transactions, and others. Our team of five skilled, caring, and compassionate trial lawyers have consistently achieved "AV rating" (the highest Peer Review Rating) through Martindale Hubbell for our legal ability and ethical standards. Contact our Goldsboro law office to schedule a free initial consultation regarding your legal concern.